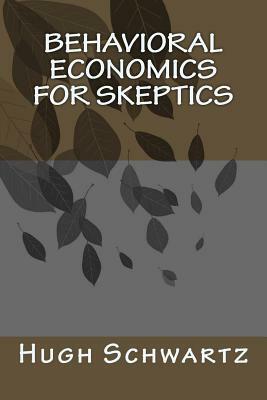 Behavioral Economics for Skeptics draws on, but modifies a good deal, materials used in a recent university course on the subject. It is aimed at readers interested in more than the one-two page presentations of this timely matter found in certain magazines, but who are not inclined to take on journal articles or books of several hundred pages. Concepts are explained fully and the jargon of economics is minimal. The sections are as follows: 1. Introduction 2. Historical Background 3. Methodological Considerations 4. Preferences 5. Heuristics or Rules of Thumb 6. Prospect Theory and Framing 7. Other Theories Alternative to Expected Utility 8. Mental Accounts 9. Inter-Temporal Discounting 10. Experienced Utility, Memory and Anticipated Utility 11. Visceral and Emotional Considerations 12. Strategic Interaction 13. Neuroeconomics 14. Altruism, Justice Social Norms and Institutions 15. Happiness 16. Major Applications: Behavioral Finance Public Finance and "Nudging. Hugh Schwartz taught in several universities in the United States and Latin America, and served as a consultant to international organizations. He edited several books for the latter, and subsequently wrote the following, oriented to behavioral economics: A Guide to Behavioral Economics (2008, reprinted in 2010, Higher Education Publications); Urban Renewal, Municipal Revitalization (2004, reprinted in 2006, Higher Education Publications); Rationality Gone Awry? (1998, Praeger, 2000 reprinted in paperback).